Keeping attendees, staff, and everyone involved with an event safe is perhaps the greatest responsibility of the organizer. For that reason, it can also be one of the most stressful and confusing elements of planning and pulling off said event. With that in mind, your friends at Joffe (okay, acquaintances) have put together an explainer of the basic terms and strategies behind planning event safety. If you’d rather read a list of questions that any event worth its salt asks before they start, click here. Identifying Hazards: One of the first steps in assessing your event’s level of risk is to think critically about the challenges that will be faced. It can be helpful to group these hazards in order to understand them better. For example, the human hazard factor involves things like the type and size of the crowd expected, as well as the amount that attendees will participate in the event. An obstacle course will face different challenges in this area than a music festival. Another potential problem area is technological hazards. This involves machinery that your event will utilize, as well as utilities like gas, electricity, and water. Would your event be okay without heat? How appropriate is your supply of bottled water in case of an extended-length emergency? Natural hazards are another safety concern at every event. What are the conditions of the event location. Tricky terrain could cause injuries, and the general layout and location of a given site will present specific challenges. Finally, environmental hazards must be considered. For most events, this means reviewing typical weather patterns at the time of the event. Excessive heat is one of the greatest safety risks to every event, and if you know that it’s a possibility, it can be mitigated in advance. The precautions taken will vary depending on the event, but severe weather should always be prepared for. Risk Assessment: Once hazards have been fully identified, the next step is to assess the level of risk each hazard brings with it. That can be simply achieved by using the bane of many a middle schooler, math. Take any hazard that you’ve noted as a potential issue and rate it from 1 to 5 in both likelihood of the event occurring and the consequences if it did. So, if an event is almost certain to occur (scoring a 5) and would have a moderate impact if it did (scoring a 3), that hazard scores a 15. Do that with each of your hazards and you’ll have a rough outline of your safety priorities. Anything over 5 probably deserves your attention in some form or fashion. Risk Control: Okay, we know the potential problems and we’ve sorted them into a priority list. Let’s take some action! Here are some strategies for eliminating, reducing, and mitigating risk at your event. Elimination- Removing the hazard entirely by implementing a new process or doing something differently. Maybe the $1 beer stand is retired! Substitution- Replacing dangerous materials or situations with less dangerous alternatives. Perhaps the barbed wire water obstacle is replaced with a kiddie pool! Engineering- Containing the hazard through design improvements. After many biting incidents, the event was moved to the other side of the lake, away from the swans protecting their habitat! Administrative- This is one of Joffe’s safety strengths, if we do say so ourselves. Administrative risk control occurs when safe operating procedures are in place, backed up by effective training and monitoring. This is the year we train all employees on identifying signs of heat exhaustion! Personal Protective Equipment (PPE)- PPE is a preventative measure. It can range from cups of water passed out to runners to ponchos distributed in the rain, and everything in between. One final thought on event safety risk assessment. One of the greatest resources to be utilized is your own team! Discuss particular hazards with people who have dealt with them in the past, and don’t be surprised when they have innovative and money-saving ideas to tackle the issue. We hope you found this useful when planning your event! If you’d like to learn more about how Joffe Emergency Services can take some of this safety planning off your plate, go here. 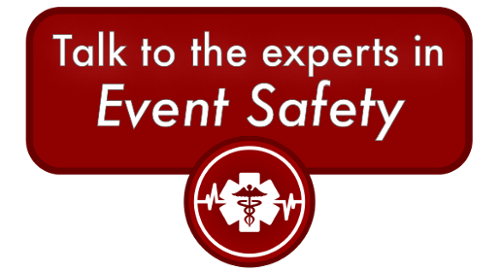 Read more articles on event safety below. What Makes for an Effective Threat Assessment? Maybe this article made perfect sense. Awesome. Maybe it didn't! That's okay too. If you'd like to discuss event safety more with cheerful and informed Joffe professionals, click the button below!